Back on May 2nd, I had the joy of giving a reading from my book to faculty and students at Spring Arbor. It was a really wonderful experience and I deeply appreciate the support of colleagues and students alike. (In related news, I learned yesterday that I earned enough royalties in February for Jeralynne and I to go to Starbucks!). I talked about the general thrust of the book and then read passages from the chapter where I connect different components of the academic world to the travelers in The Wizard of Oz. In short, I argued that faculty members are like the Scarecrow (favoring brain), student development folks are like the Tin Man (favoring heart), the administration is like the Cowardly Lion (needing to overcome risk), and the students are all Dorothy (thinking their destination is more important than the journey). This is certainly less than modest, but in preparing for my presentation I was struck with the importance of this paragraph about administrators. First, courage requires a commitment to the success of the organization over the long run and not just the short run. In some ways, an administrator must be focused on the university your children will attend more than on the one you attend. The future must be anticipated if the past practices are not simply to be repeated year after year. In the absence of courage, administrators may be tempted to look back to the university your parents attended. Courage involves moving forward and never backward. This passage has been echoing in my brain when I read about events at Bryan College and Cedarville University. It resonated when I read a retweet from Liberty University, where Eric Metaxas told graduates “God has invited you into a grand adventure, to be a soldier in his war against the forces of darkness.” It resonated in a conversation with one of my senior general education capstone students when she talked about the ways that this generation is different and pondered what the next 15 years would bring. It echoed when a friend at a Christian University posted about a potential heresy trial at yet another Christian university exploring a faculty member’s view on creation. His institution has had its own share of struggles in dealing with issues of contemporary society in which the administration was understanding but still not forward-thinking. As president of one of these “institutions”, my experience has been that the pull of institutional preservation is more subversive than I expected, more agenda-consuming, and is relentless. While the Borg may be right (resistance is futile, you will be assimilated), I have found God present in the work in kind ways. The “pull of institutional preservation” is what makes rewriting the covenant statement at Bryan seem like a good idea. If there are contemporary challenges seen in dialogue about Adam and Eve, the way to fix it is to make certain that which past generations expected. Simply remove the question from consideration. If Cedarville considers what to do with issues of gender, make life uncomfortable for female religion faculty and have the president preach on “Biblical Gender Roles”. In a world with increasing diversity and increasing complexity, recast the Christians’ task in dualistic spiritual warfare terms. When Dorothy, the Scarecrow, and the Tin Man meet the Lion in the forest they are afraid of him. But only for a moment. They quickly understand that his strategy for survival was to pick on weaker creatures and keep them scared. But soon thereafter, their dominant emotion seems much closer to pity. The only hope was for him to join them on their trip to see the Wizard to find the courage he’s lacking. 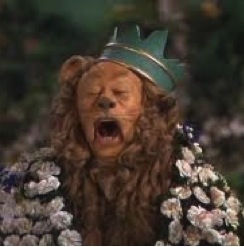 The Cowardly Lion gets two songs in The Wizard of Oz. He has a short version of “If I Only Had..” but when they get to the Emerald City he gets to sing “If I Were King of the Forest“. In the midst of the song about courage, he describes how the small animals would show him deep respect and all creatures would know he was guided by compassion. Courage is part of character that allows one to lead (“what makes the muskrat guard his musk”). It allows a leader to step forward in faith, assured that they are not alone even when constituents write letters to trustees. One of the consistent themes in the research on millennials is that they have little use for hypocrisy (the literature remarks on their “BS detectors”). I think this is related to the anti-institutionalism that shows up very clearly in survey research. They have less faith today in political institutions, economic institutions, family institutions, and religious institutions. This seems to be true to a much greater extent than previous generations. Leaders stand at a pivotal point in this generational succession. A Christian University leader who can engage the current generation and look down the road toward the next will serve her institution well, develop key commitments in the current generation, and show the relevance of Christian education to the rising generation. One who lacks courage is far more likely to hold a hard line and create antagonism with the current generation, increasing the odds that the rising generation will fine the university irrelevant. Bryan College ended the academic year facing the likely outcome of losing 20% of their faculty due to the actions of the president and trustees. Students responded last week with petitions, stood in protest in the final chapel of the year, and wrote to the trustees. Not just a few students but in numbers approach a third of the student body. These students learned some valuable lessons this spring, important ones that will serve them in the future. How to deal with unpopular decisions. How to engage those in power in honest communication. These are issues that are at the heart of critical thinking and Christian engagement. But they learned these lessons at a price. They learned that their beloved institution wasn’t to be trusted, that it wouldn’t listen. That in spite of rhetoric about family and community, in the end they didn’t matter. I’m currently working my way through Walter Brueggemann’s Truth Speaks to Power. The first chapter is about the Exodus story and how Pharaoh organizes power against the slaves. It is their cries of pain and suffering that reaches God (not, as Brueggemann says, in a prayer but simply in their grief) so that he calls Moses forth for change. Moses becomes a courageous figure against the powers that be (even though he doubts his own skills). Christian Leaders who lack courage will fail to see how they pattern their actions after those of Pharaoh, even while seeking to do God’s work. In the end, it is only courageous leadership that stands in the face of uncertainty. Power-based leadership doesn’t just lack courage, it’s ultimately ineffective. As Princess Leia tells Governor Tarkin, “The more you tighten your grip, Tarkin, the more star systems will slip through your fingers“. Courage requires a loose grip and a willingness to engage. May God grant our Christian institutions more leaders with that kind of courage.